A group of banks led by Royal Bank of Scotland (RBS) has said it is interested in buying Dutch bank ABN Amro in a deal worth some £49bn. The mooted offer would trump a deal that was agreed with the UK's Barclays. 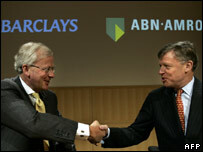 Barclays planned to merge with ABN in a move that would create one of the world's biggest banks, valued at £94bn. RBS and its allies, which are Spain's Santander and Belgium's Fortis, are proposing a deal worth 72bn euros (£49bn; $98bn), or 39 euros a share. ABN directors have invited members of the consortium to a meeting to discuss its proposals. ABN's shares climbed 4% to 36.41 euros in Amsterdam. 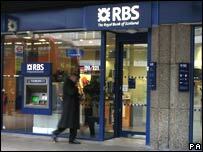 In London, RBS saw its stock dip 0.7% to 1,998 pence, while Barclays gained 1.6% to 724p. The deal, should it be formalised, would be financed by 70% cash and 30% of RBS shares. RBS said it was worth about 13% more than the offer put forward by Barclays. Some analysts have questioned whether Barclays would be able to table a higher offer. "The battle over ABN broke out in earnest this morning," said the BBC's business editor Robert Peston. According to the RBS group, a formal bid would only happen if ABN Amro halted plans to sell its US operations, LaSalle, to Bank of America (BoA). "RBS will act prudently and will only proceed if it is in the best interest of shareholders to do so," the bank's chairman Sir Tom McKillop said at the firm's annual general meeting. 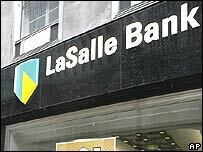 The sale of LaSalle was a key part of the merger deal that Barclays secured, and had angered many shareholders who saw the $21bn ( £10.5bn) sale as a poison pill put in place to put off rival bidders. ABN said on Wednesday that it was possible for another buyer to be found for LaSalle, but only if the offer topped Bank of America's. "ABN and its advisers are actively engaged in soliciting alternative bids from the largest US and international banks that may have an interest in LaSalle," the Dutch lender said. A rival bidder has 14 days to come up with a counter-bid for LaSalle; BoA can then match it within five business days should it want to. BoA would be in line for a $200m "break-up" fee should its purchase of LaSalle fall apart but the firm said it expects the deal to be "fulfilled under its current terms". "If this was a fair fight and there wasn't this poison pill, this would be an open and shut case as of this morning," said Alex Potter, an analyst at Collins Stewart. "However, dealing with the way the LaSalle sale has been constructed, it's all about whether there is some way of that being withdrawn," he added. According to the BBC's business editor, ABN will not want to halt the sale of LaSalle, and will view RBS as "a hostile invading force rather than an institution trying to offer more money to its owners than Barclays". UK hedge fund TCI, which has been critic of ABN's performance and strategy, was quick to give its backing to the RBS-led group. "The board of ABN must allow the RBS consortium full access to conduct due diligence immediately," TCI said. "The board must recommend the RBS consortium offer, subject to the diligence condition being met." RBS and its supporters claim that their deal would entail fewer risks and could offer a better fit with ABN's existing operations. "The banks believe that the potential transaction will create stronger businesses with enhanced market positions and growth prospects in each of ABN's main markets," it said. Should the group table a successful bid, then its is expected to break up ABN, with RBS taking LaSalle, Santander getting Italian and Brazilian operations, and Fortis running ABN's Dutch and Belgian retail business. "The gloves are now off and ABN finds itself in a difficult situation," said Richard Hunter of Hargreaves Lansdown. "The significantly higher consortium offer cannot be ignored." "The general synergies seem to favour the consortium bid, even after Barclays' head start on proceedings," he added.